WHAT IS IT LIKE TO LIVE IN KENYA? “What is it like to live in Kenya?” This is for Jules ( http://julieangelos.com/ ) , my dear friend who got me started on my blog and who continues to show me support. Living in Kenya is a huge basket of fruit, vegetable and meats. With a side of coke (soda). There are so many wonderful and enchanting pleasures to living in this country that match us so well and there are vast amounts of plight, drought, death and corruption that is equally the same. It is a constant tight rope to balance on and not get lost in the negative, but always remembering to celebrate the beauty. The Good, The Bad and The Ugly! From our perspectives, here are some of the stories and insights to living in Kenya, a country we love and are adopted daughters of and truly grateful for it. Dawn (The Goddess) and I are single mums, which means not getting invited to too many dinner parties: how do they fill the extra chair where our husbands once sat? Also, as many people in the world have heard the saying, “Are you married or do you live in Kenya?” Dawn and I DON’T SHARE! As we have had to tell many married woman here, we want nothing to do with their husbands. The sad thing is there are young women here who do share married women’s husbands and don’t care who it affects. I know this happens everywhere in the world, but here you cannot keep it secret and people have been known to die because of it. Remember Lord Earl? We have to take on the Black African Men who have a hard time differentiating us from Black African Women (whom we consider our equals). We are single! Where do they put us? There is no man for them to discuss business issues with – they have to deal with us, or should I say, we have to “deal” with them. When my children were first starting preschool and kindergarten, I would have to drive them through a part of town that was busy and had bars and shops (kiosks) along the side of the road. Inevitably there would always be a dead body on the side of the road in the morning. Tiva and Rian used to ask me as we passed them, “Mummy is that man dead?” “Sweetheart, I think he just had too much to drink,” I would say, as I felt they were still too young to need to know that side of life. We have freedoms here to be ourselves in certain situations and at the same time we have to be the most amazing “lady” in other scenarios, you will be judged here at all times as Kenya gossip is endless and ruthless. Anyone can do something off coloured upcountry and all of Nairobi will have heard about it the following day. The two year wonders as we call them (UN and N.G.O. employees, here on two year contracts) have out-priced most of us locals: whereas before renting a house was reasonable – they came in offering the landlords four times the amount that was normal to all of us and have made it impossible for our grown children to move out, as they can’t afford it. It takes them time to get a job and save up and it is twice as hard for single parents to continue to provide for our children the same way. The Somali pirates made it even worse as they bring in all their cash and throw it down in front of a landlord and buy the house for ten times the worth, just to hide their cash in Kenya. You have to always beware that at any time and at any place you can be robbed, which could also mean, beatings, being shot or raped, but if you are lucky you will be left on the side of the road to find your way home. This normally only happens in the cities, as they know the upcountry farmers all sleep with their guns. Upcountry people who have farms have to deal with cattle robbers and gun fights. Now all this sounds a bit crazy, but it is just the norm and if it does occur no one really talks about it as it is not that big a deal unless someone gets shot, which is never a good thing, unless of course it is a poacher, then there are usually pats on the back. Most of us have had friends and family members killed in road accidents, as many drivers here just buy their drivers license and the Matatu drivers (Matatu: local transport for people in a mini bus) are the worst. They drive as fast as they can and on whichever side of the road they feel like when there is traffic. Different from the rest of us, who drive on the ‘best’ side of the road, as cars have been known to get swallowed up in our potholes. I read in the newspaper a few years back: “Man kills wife in rage, sentenced to 6 months in jail.” Next headline: “Man kills neighbours cow, sentenced to 6 years in jail.” Hope this helps you understand women’s rights and value here. Circumcision still takes place for both men and woman even though it is against the law for women. This issue is difficult, because a lot of the woman in these tribes ask to be circumcised. If they aren’t then they are shunned and never considered a grown woman able to be married. The women in these tribes who can get away and have educated parents can escape it, as the parents just tell everyone that the girl had it done while they were visiting an auntie or grandparent that lives elsewhere. But, this is rare. Most Black Kenyans have never seen a lion, elephant or any wildlife for that matter. Oh our electricity! Such a wonder to us. We get excited when we switch our lights on and they work! It is not uncommon to be sitting having a dinner party and the lights go out, the conversation will continue in the dark as the hosts reach for the candles, always nearby, light them and carry on. Hospitals are tricky. Just because they look impressive does not mean they are. Ones that look like they are dated back in the 1950’s can be amazing. Our doctors are wonderful and are sought out all over the world. There are only a few operations we would leave the country for and either go to India or South Africa, obviously wherever you could afford really. We also have clinics and doctors here from all over the world who specialize in certain procedures, for example my house lady needed a hip replacement, the cost 400,000/- (USD 5,128), she had it down at a hospital most would not want to walk into, but it is renowned for the great work they do. Now true most Kenyans can’t afford that, but they will through a harambee (a fundraiser) and come up with the money. Water is considered gold here! It is common knowledge, if you are out in the bush and you’re invited to a meeting from a Maasai, he will offer you a coke before handing you a glass of clean water. We also have the ability to have amazing staff, who helps you to raise your children and look after your house and garden while you are trying to bring in money. You can jump in the car and drive (depending on where you live) 15 minutes or 6 hours and be in Gods Palm. Nature all around, pure beauty and an orchestra of sounds that would match and may even out do the New York Symphony. The food is fresh and has amazing flavour. You can be a child and run around naked with no shame, roll around in the mud and get as dirty as you want. We believe in our kids getting dirty as it helps their immune system. Children here can make a toy out of anything! Give them a tyre and a stick and they are happy, give them wire and they will make a car to play with. Most children are loved here, it is just in recent years with TV and movies that things have started to change. Children at very young ages are given huge responsibilities and take them on with no problem. You will see a four year old walking to school alone or with a younger or older sibling, or a six year old carrying their baby sister or brother on their backs. Children who live in the bush will be sent out to tend to the cattle, goats and sheep. If you live out in the countryside and ride horses, you can go for a hack and within minutes be riding near zebra, giraffe, impala, elephant (if your horse is alright with that). You try to stay a distance away from lion or leopard, no need to explain, I hope. Now the subject so many people ask me about ‘snakes.’ Yes we have a vast variety of snakes, venomous and non-venomous, but I promise it is rare to ever spot them. They don’t like humans. In 40 years I have only seen 4 poisonous snakes and one of those was dead. I have seen a few more non-poisonous, but mostly brown house snakes which are very sweet and help with the rats. The problem is they come in a multitude of colours and identifying them is not always easy for me. Both Dawn’s and my children have attended private schools and all them were accepted to top universities, meaning that our educational system, when it is private, is exceptional. There are monkeys on the campus and quit often children will be chased by them, if they haven’t learned how to deal with them they will learn fast. Drinking age here is 18, although most of the children start taking beer bottles off the tables when they are tall enough to reach them. You can usually find them under the table giggling. As parents we give our children sips and teach them how to drink without getting drunk, as it will always be offered to them at parties. Sort of like Italian children and wine over dinner. Dancing is a big part of the culture here, for our children it is a rite of passage to learn how to rock and roll, they love it. Bush parties, we love them! Huge bonfires, good friends, your 4×4 and tents. Depending on who is cooking there is usually amazing camp food (I am never asked to cook, but will bring my cook if asked). Occasionally you will get the curious hyena looking on or hear lion in the distance, elephant sometimes pass by and all around great fun. Sun Downers: After a very long day at work or a weekend break, we will get our finger food and drinks and drive out to the Ngong hills or find an open space, park the car and watch the sun go down. I hope this answers some questions about living in Kenya. IF you have any others please feel free to ask and I will do my best to answer them. My daughters Rian and Savanah asked if they could have a story just about them, posted to my blog. I asked which one they wanted me to write, to which I was told by Rian, ‘No Mum, I want to write it because you weren’t there, it was just Savanah and Me.” I said that would be great and I look forward to reading it. Allow me to introduce Rian’s story that took place at our farm in Nanyuki in 2003. It had been a very normal day for the lives of Tiva who just 13 years old, Rian who was 12 years old and Savanah who was 10 years old. It was early in the morning in Nanyuki but the sun was already scorching through their private classroom window, where the girls were being home schooled before they would start the new semester at Hillcrest, a private school in the capital city. The teacher, Scott, was busy trying to explain the importance of grammar, and while all three of the girls were entirely uninterested, Tiva was the only one who persisted. As Scott took a break to go to the bathroom, Rian convinced Savanah that they should escape, Tiva, being the ever unwavering academic would not leave, Rian, being the ever bored student had spent the first thirty minutes of class trying to figure out a way to leave, and Savanah being only about ten years old was always eager to follow whichever older sister appeared to have a more exciting plan of action. As soon as Scott left so did Rian and Savanah, with the warning from their oldest sister about the trouble they would get in to. Little did they all know, the trouble would not pertain to their sure to be angered teacher. Rian and Savanah ran out of the class room and in to their backyard, which was just a couple hundred acres, but a couple hundred acres was like owning your own unexplored planet when you were two little girls. Their dogs, an Alsatian and two Jack Russell Terriers, came to them immediately, the loyal pets always just as eager for the girls to finish class as the girls were themselves. “Where are we going?” Savanah asked, “We could go to the river,” Rian suggested, “No, we do that all the time,” she refused and then suggested, “We can play in the woods up front.” “No, mum will probably see us,” Rian reminded her. “Okay… Let’s go to the dam,” Rian suggested after a minute of them hiding behind the staff quarters with the dogs wagging their tails, anxious to know the plan. “The big one or the small one?” Savanah asked, “The small one,” the small dam was an unfinished mess of over turned soil and a small lake of water. And with that, the two small girls set off, going the short way round to the dam, the three dogs never leaving their sides. As they climbed over the hills of dirt and in to the cavity of the dam they smiled, “Did it again,” Rian exclaimed, “I don’t know how Tiva stands him, I hate him!” Savanah burst out, after an incident where Savanah tried to convince Scott to not unnecessarily kill a bee and he ignored her pleas, she was not particularly fond of the man. Savanah was allergic to bee stings, she wouldn’t touch them, and wouldn’t want them in the same room as her, which is why Tiva or Rian would always willingly trap the bee and get it out of the room for her. The way Savanah found out she was allergic was when she was trying to save a bee from certain death and it stung her; nonetheless, she would not kill them and as long as her sisters would get it out of the immediate vicinity she was happy to co-exist with the bees. “Do you want to go in?” Rian asked, after a minute of silence, watching the dogs run around, sniffing the area and playing with one another. “No, but we can put our feet in,” Savanah negotiated, “Okay,” Rian agreed, and the two of them walked down in to the small basin. The dam was only partially constructed at this point, it had walls of soil around it, these mounds were so high that once you were in the water you could not see outside the dam, which had never seemed to be a problem before. As the girls stepped in to the dam water they laughed about how cold it was, threw some mud at each other, and played with the dogs; infinitely better entertainment than sitting in class. The best thing was, living on a farm, there was no way their teacher or anyone else would find them because there would be just too many places to look. This too never seemed like a problem before. After about twenty minutes of playing around and aimlessly starting new games and talking about their hate of class, a noise erupted, a low grumbling, filling the dam. Rian and Savanah were silenced by it, the dogs all stood still, tails out, ears up, staring at the mounds of soil. “What was that?” Savanah asked, “Probably nothing,” Rian declared, but when she saw the dogs still hadn’t relaxed despite the noise having stopped she got worried. She had only ever heard one thing make that noise, it was the same animal who left a mess of bones in a hollow near the river under a mess of twisted trees; it was a leopard. They had seen the leopard before, but just briefly, and their mother had been there. “Rian, what is it?” Savanah asked, knowing that it was indeed something and knowing that the dogs would have gone back to their own enjoyment had it been nothing. “Shatu!” Rian hissed, and her Alsatian didn’t move, “Shatu!” She called his name again, and reluctantly the large dog trotted over to her, “Jema! Hap!” Savanah called her own dogs over, and as soon as they reached her heel she swept them both up in to her arms. Rian wished she could pick her own dog up but knew it wasn’t possible, so she gripped the loose skin and fur on his neck. Again, the noise happened, but it sounded like it was coming from a different mound, this one behind them. The girls and their dogs whipped around, it was a low growl, a released hiss, like a wild echoing purr. “Rian…” Savanah looked to her sister, “It’s the leopard,” Rian told her, Savanah nodded. They stood there not knowing what to do. Then they heard it move, it flicked up the soil as it left one mound and went to another, coming around the side of the dam, the dogs started whining, kicking to be set free, Rian crouched down to get a stronger grip on Shatu and Savanah strained to keep both dogs in her arms. “Where should we go?” Savanah asked, Rian looked around quickly, not sure what to do. The leopard let out another hiss, almost like a sigh, but it was coming from the other side of the dam now, the leopard had moved around them instantly. The dogs whined and growled, wanting to be set free. The two girls stood there, in the middle of the makeshift arena, not being able to see over the mounds they could not see where the leopard was, but they could hear it moving. When dust flew up again from another location, and the cat unleashed another grumbling hum, resonating through the walls, Rian believed she knew where it was. “This way,” she decided, moving out of the back of the dam, opposite to where the leopard was. They moved as quickly as they could but slowly at the same time; a speed difficult to explain to anyone who had never encountered wild animals, you needed to get to your destination as quickly as possible but if something went wrong, if the animal spotted you, then you would need to be still and hope your submissive pace and stance would show you were no threat. Rian pulled her dog towards the back of the dam, his reluctance to go that way showed he knew where the leopard was and wanted to go find it, they were going the right way. Savanah followed in tow, they began to walk over the mound of dirt, and just as they reached the top, the leopard called out again, shooting both girls in to action, they made their way to the far trees, trees that grew parallel to their farm house. The dogs were urging to go back, trying to escape their owner’s holds, but Rian and Savanah, both deeply attached to their pets, would not let them go, which did slow them down a bit. They made their way up the line of trees, through the growth of purple flowers, and were home, in the main backyard between their house and the staff quarters. They dragged their dogs inside the house, afraid they might go back to the leopard, and shut the doors. Quickly, they ran in to their classroom, which was also in the house. “Where did you two go?” Scott began yelling, “No where, Scott,” the girls chimed, both shooting looks to their older sister, “They wont leave again,” Tiva stepped in, and with that, they continued with class. All right, time for a Kenya Story. This is a wee bit longer then most stories (sorry) but, lots of fun and explains things one should not do while on safari! It was Dec 25th 2006 and as tradition has it we always go to the coast for Christmas and New Years Eve Holidays. My Dear sweet Princess Savanah (my youngest, then 14) decided she wanted to fly down with her friend and her friends family and meet us there, while Tiva then 17, Rian 15, David (who would be 21 in a few days), Dawn (the goddess) and myself decided to drive down in our glorious old Land Cruiser with our driver David, who was a new hire. We all wanted to camp that night and drive into Watamu the next day. Dawn had booked us a tent at a very special, African owned and run camp in Tsavo. It was cheep and had an ok reputation, plus the kids could camp just next door to us at a KWS campsite. Yes, this was one of those years Dawn and I tore up our house scrounging for every last dime we had to ensure that we all had fun and an amazing holiday. We were driving through Tsavo and the only mammal we saw was an elephant in the far off distance, as it had been a bad drought year. After around 10 hours on the road we reached the camp. Walking in to the camp Dawn and I were pleasantly surprised at the cleanliness of the place and the kindness of the staff. One gentleman showed us the path that would lead us to the campsite, where the kids and David would be staying. Yes, alone! Are kids have been camping their whole lives and know all about the bush. Plus there was a ranger near by, just in case. We helped set them up (which, in Dawns and my Motherly way means, we dropped off their tent and all their belongings, kissed them and said we would see them for drinks and dinner in the camp mess at 7pm) and then Dawn and I walked back to our tent, which we were sharing. We were walking with the manager who was showing us to our room. We arrived at our tent and set our things down. The manager was standing outside our tent and asked us if we needed anything else before he left. Dawn and I said we were fine. He nodded, and then said, “I just need to tell you a few things. One; we ask all our guest to join us around a fire before dinner so we can get to know one another and go over all the safety rules while you are staying with us, the fire will be just outside the mess tent.” Dawn and I both looked at each other and smiled (meaning, ugh) and, “Two; dinner is at 8pm.” With that he smiled at us and walked off. Dawn and I walked back in to our tent and retrieved our wine and two glasses and walked out to the plastic floored veranda to relax on the safari chairs. Beautiful birds were in the trees and the smell of the bush was the perfect perfume to relax us. Not far off was another tent and a very nice African couple that were so excited to be camping. The gentleman walked over to our tent and politely introduced himself and then said, “If you would like to see some Impala they are eating right behind your tent”. Dawn and I got up to see, as we hadn’t seen any wildlife driving in, except that lone Elephant in the distance. We slowly and quietly got up and walked around the tent and there they were, 5 goats! We just busted up laughing; thank god the nice man had walked away before seeing our explosion of laughter. We went back to our tent and sat drinking our wine enjoying the stillness of being on the ground and out of our Old land Cruiser, which was extremely bouncy to say the least. It was time to get ready to go join everyone by the campfire, we had already let the kids know what time to join us for drinks before dinner. We were starving and we knew the kids must be too. The mozzies were out in force and I had left my mozzie spray with the kids. Dawn had not packed any, knowing I would have packed some. She looked at me and said, “we have to do something, hold on I have an idea”. Now remember this is, ‘The Goddess’ my all-knowing dear and kind friend who confirmed that humans can be kind and good. She taught me how to be more diplomatic. To say the least I TRUSTED her. She had walked in to the tent and came back out with a can of DOOM in her hand. She said, “Here let me spray your legs!” “ Are you crazy, that stuff is pure poison!” I bellowed. Dawn reassuringly told me, “Don’t worry, it will be fine, I will just spray a little bit, it will work!” Now I am thinking TANA DON’T DO IT! Well, unfortunately I TRUSTED Dawn. She gets this look on her face that makes you think twice of your own good judgment. So she sprayed away, her feet then mine. As I was waiting for the burning pain to follow, I was relieved to feel nothing. I thought to myself, darn she was right again! LOL and left it at that. We headed off to the campfire and found around 10 other people plus the kids waiting for us. The manager stood up and started his introduction spiel. “We would like to welcome all of you and wish you all a Happy Christmas. I have a few points to go over with everyone before you head off to dinner.” At this point Dawn, the kids and I were just waiting to get to dinner and eat. We were all sitting there listening, when we couldn’t believe what we just heard. The manager of the camp says, “ If you see a lion while you are back at your tent, DO NOT call me, I wont be here, no one will be at the office, stay where you are or in your tent and call out MAASAI, he should get to you as soon as he can.” Dawn and I fell off our logs that we were sitting on. We tried so hard not to laugh out loud, but we didn’t succeed. If the man said anything after that, I truly don’t remember it. The kids and us couldn’t stop laughing at the looks on the other guest faces. They looked like a deer in headlights. We were trying to figure out if they were scared that a lion could walk into camp, or that a Maasai would “try” to get to them on time. We all had a wonderful Christmas dinner; we walked the kids back to their tent and made sure they were all settled in. We walked back to our tent, trying to get each other to call out ‘MAASAI’ just to see how long it would take for a Maasai to get to us, but we were behaved and didn’t. We got to our tent and got in are own beds. Dawn had let me pick which bed I wanted, very kind of her! I got comfortable and had the lantern on to read my book, when all of a sudden my feet and legs started to itch, then burn. I asked Dawn if her feet were itching, to which she replied, “no”. I informed her that I thought that I had bed bugs. I threw back the covers and turned on my torch. I didn’t see anything! Except a huge rash running up the front and back of both of my legs, from were Dawn had sprayed the Doom on me! Dawn was cracking up, most likely because she didn’t have an allergic reaction, and seeing me in a scratching frenzy made her whole night. From my stupidity from the doom incident, I didn’t get much sleep. Dawn on the other hand slept like a baby! I jumped in the shower first just letting the cold water hit my feet and legs trying to get some relief, it worked for a short while. Dawn kindly reminded me we could stop at a chemist shop in Malindi, which was another 20 minutes on from where we would be staying in Watamu and we still had about 5 hours drive in front of us. We met up with the kids for breakfast who were full of exciting stories from their own camping experience. The stories involved Baboons in camp and David who forgot to check himself for ticks before going to bed and woke up itching like me. There were at least 6 ticks on his body, of which the girls kindly removed with huge mocking for each tick they plucked off, at least the ones that were not in private areas. We sent one of the camp staff to find David, who had been in the staff quarters, making new friends. We packed up and got back on the road. We had been driving about 2 hours when we hit a small town, where everyone stopped at while driving this road trip; as it was one of the last stops to fill up with petrol or diesel. We pulled over in to one of the petrol stations. David turned off the vehicle and the kids all got out to find the nearest toilet or bush. The vehicle had been filled up and paid for, everyone but me was in the car, as I had gotten out to pay and was waiting for the receipt. I heard the one noise that makes you cringe when out in the middle of nowhere, the key being turned, and the car NOT starting. David tried about 5 times and I told him to stop, as I was afraid he would flood it. It sounded like the battery was dead, and there was no way we could afford to buy one here. I looked where the vehicle was parked and saw it was on a very slight slop. I yelled to David to put the car in neutral, which he did. Not thinking, I am sure due to the immense inching restraint I was concentrating on. I walked to the back of the car and started to push this 1200lb car forward. Now I am sure most smart people would have called out to all the teens in the car and asked them to get out and help! But no, I was a bit loopy at the time, and of course thought I was wonder woman. Sweat started to form on my brow when I heard laughter coming from inside the car. I looked up and of course it was all the teens and Dawn laughing at me. I looked around and about 4 African men were staring at me in complete disbelief. I had to laugh at myself at this point in time. The African men were walking over as I started to push again, sure enough I got the vehicle moving forward. Trust me everyone was shocked at my strength at this time. The African men got to the car just as it was rolling and started pushing with all their strength. The car started to move, and David through the car in to 2nd gear and took his foot off the clutch, and presto the Land Cruiser started. All the African men patted me on the back and were grabbing my arms muscles, extremely excited about seeing this crazy white woman pushing a Land Cruiser by herself and how strong I was! I thanked all of them and jumped in to the land cruiser. The whole car exploded with applause and jokes began about good old Mum. I thanked each and every one of them for getting off their butts and helping me! They all agreed that I was doing such a great job on my own they didn’t want to take the fun away from me! Adorable children and friend! We finally got to Watamu and Dawn and I walked to the reception area. The first thing I asked for was a large bag of ice for my massive rashes. They kindly looked down at my legs and all squinted up their eyes and said, “oh Tana, what happened to you?” I informed them that, “my darling and most dearest friend sprayed me with doom.” Yet Again, huge amounts of laughter exploded. Yes, I am the dummy. Huge bags of ice were brought to me. While Dawn signed us all in and our bags were taken to our rooms, it was time to get to the chemist. We drove up to Malindi and found the nearest chemist. I am sure I bolted in there like a crazy person looking for any kind of relief. The woman at the counter asked if she could help me, Dawn was standing by me and said, “We are looking for anything that will stop her itching.” At this point I threw my leg up on the counter and pointed (All lady like behavior out the door). She put her hand over her mouth and then slowly pulled it away to say, “Oh, that looks like it hurts!” I just thought, ‘do you think so?’ She went behind the counter and handed me some cream and a couple pills to take; I didn’t even ask what they were for at that point in time, I just popped one. I started putting on the cream right there and then. We paid the heavenly chemist and I, for the first time since the night before had total relief. On our way back to the hotel, Dawn and I stopped at the local dukas. Dawn was craving a ham sandwich. Now remember when I said Dawn and I had to find every last dime we had to take this holiday? Well, this is how poor we were! Dawn walks in finds the ham pack and puts in the trolley, she gets a roll of bread and puts that in the trolley, then ever so stealth like walks by a head of lettuce and tears off a piece and puts it in her purse. I looked at her with wide eyes, and said, “What are doing?” “ I just want one sandwich, what am I going to do with a whole head of it.” Coming from the woman who I let spray Doom on me, how could I argue with her. “Besides, they won’t mind, I have been shopping here for over 20 years.” She added. When I was about the age of 15, I was sitting in class when I received a note from the office that I had a phone call. I excused myself and ran up to the office desk and picked up the phone. As students we knew that when we were getting a phone call at school it was not usually a phone call from one of your parents telling you they loved you. “I thought it would be fun for you to be on air with your old man, plus you’ll do great as long as you listen to everything I tell you, kid. I love you. Mom should be there in the next 30 minutes, go home and get some shorts and tee-shirt. Love you.” And the phone went dead as my heart jumped into my throat. I am not sure what the poor secretary was thinking as she overheard this conversation, but I am sure she was thinking of calling child services. I smiled at her and just said, “Family Fun Time, thank you,” and walked away. I couldn’t stop going over the stunt in my head. I had been around alligators and didn’t have a problem with them nor was I afraid of the stunt, but pleasing my Dad on National TV, now that was terrifying. I hated to let my dad down and loved to prove I could do anything the men could do. 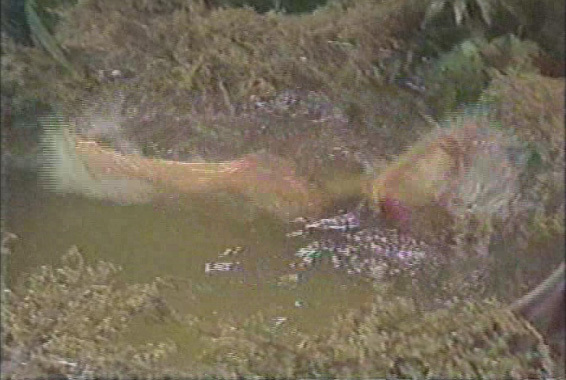 “Mom, I am not wearing a tee-shirt while wrestling an alligator in water on national television! Don’t need the world to see my ittie bitties, thank you very much!” I went to my room, picked out a red flannel shirt and jean shorts and got changed. I packed clothes to change in to afterwards. I knew this would not please him and he preferred me to look more girlie, but he had a tomboy for a daughter and this was what he would have to settle for. We got to the set and everyone was hustling and bustling around. I loved being on set as I felt right at home. Mom and I were greeted when we walked in the studio and we were shown where my dad and the guys (trainers) were. We walked over and I was greeted with a hug from my dad and a collective “Hey Tan” from the guys! “He is in the back right now chilling. He is just over 6 foot, perfect size for you!” I just gave him one of those quizzical looks. I was 5’6”. “What I feel comfortable in,” I said. “Well, I guess it will do,” said Dad. Dad pulled me to the side where no one would hear us and started to talk to me about the stunt. He always talked to me right before and never let me rehearse, which was unheard of for most stunt people. Dad new I had already been working with animals longer then anyone there besides him and he trusted his animals and me completely. Keep in mind that doesn’t mean I went in all conceited, it means I knew better then to ever think I couldn’t get hurt. I always had a respectful fear, a lion is a lion not a dog, no matter how loving, their natural instincts always came first and I respected that at all times for every animal. The animal’s safety and the animal feeling safe with you was also very important. “Okay Kid, this is what you have to do. The men are going to hold the alligator in position for you when you step in to the water. I want you to kneel down, one knee on the right of him the other leg over is back so you can lie down when we let go…” This conversation lasted about 3 minutes, we covered hand and body positioning, his teeth, mouth, protruding scales, nails and tail- I had it all down. I was ready. “Of course you will go up with me! You’ll be fine and Mike is looking forward to meeting you.” That was when my heart started to pound! I hated being in front of the camera, alligator no problem, but when that darn red light went on and I was meant to talk, the world started to spin. I went back and reacquainted myself with the Alligator and gave him a pat. All the guys were there making fun of me as usual and trying to wind me up, but it never worked, I was comfortable with stunt work and at home with the animals, it was all the rest of it, which no one knew, I was smart enough to keep that to myself and just breathed deeply. We were introduced and walked on stage. I was trying to smile without my lip quivering, it always gave me away if I didn’t control it. Mike and the guests were all very nice and concerned for me. Dad and I assured them I would be fine. I was thinking, just let me get off this stage. Finally it was time for me to wrestle the alligator, I just thought ‘thank god’. We all got up and walked over to the metal pond and I stepped in, my whole body relaxed as soon as I was with him, my head cleared, my heart slowed down. I got in position and the guys asked me if I was ready. I said “Yes, let him go,” and the wrestling started. When I was in the middle of any stunt, everything came naturally and instinctively. I knew before I started this stunt there was only one thing I had to do, and do it fast, as I would only be on camera for less then a minute, and that was to figure out how to hold him tight and flip him over so his belly was up. Time was ticking down, I couldn’t hear anything except the alligator and the water splashing. It was about 20 seconds into everything I got my hands and legs in position, I was getting tired so I had to act now. I pulled him in to my chest. I took a deep breath: I knew I might go under the water with the weight of him on me. I held on, flipped us both and his beautiful shiny belly was up! Just as I did this I heard “Cut” and then all the applause from the audience, Mike and his guests. I flipped us both back over and waited for the guys to step in and take over.